situated in the middle; median; nearer the middle line of the body or nearer the center of the dental arch. The mesial surfaces are those closest to the midline of the dental arch. From Darby and Walsh, 1994. (mē'zē-ăl, mes'ē-ăl), Do not confuse this word with medial or median. See note at medial. Nearer to the midline or most anterior part of the dental arch. /me·si·al/ (me´ze-al) nearer the center of the dental arch. Dentistry Situated toward the middle of the front of the jaw along the curve of the dental arch. 1. Toward the median plane. Nearer to midline or most anterior part of dental arch. 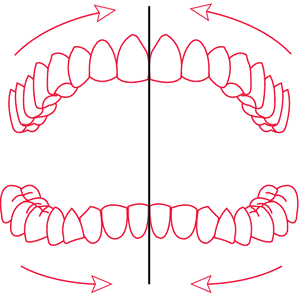 adj situated in the middle; median, toward the middle line of the body or toward the center line of each dental arch. n the drifting of teeth toward the midline or forward in each dental arch to produce crowding in the permanent dentition of an older adult. adj mesiocclusion on one side.